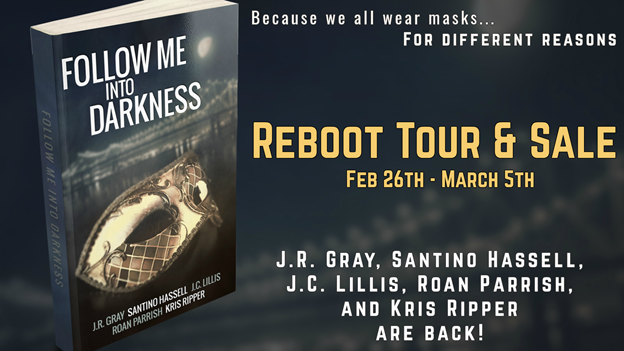 Five of the top voices in queer romance teamed up last year to give you Follow Me Into Darkness: Five Tales of Carnivale Romance. Their stories were bold, they were decadent, they were achingly sinful. They begged you to remove your masks just once and many of you listened. Their stories looked into the heart of modern day New Orleans and its steamy past, followed an errant queen in disguise, walked through the lush streets of Rio, and then continued straight on into the lofty pages of a Shakespearean soliloquy. Mardi Gras is coming fast and Follow Me Into Darkness is back to seduce you. It’s on sale for only 99 cents from 2/26 – 3/5 plus the authors are giving you gifts and treats along the way!